“Helluva songwriter,” says bluesman Jimmy D. Lane of Hallal. “The right elements of blues and funky sensibilities keep it real” with his "gutbucket" band, says The Noise of Boston. Their sound is "tight... smoldering... electrifying..." declares Blues Bytes. And their new live-in-studio album, Hatchet Blues, is "lyrically and sonically... a fine piece of work," judges the UK's Blues Matters!. Jim Antonellis (drums): Brother-in-arms with Hallal for some 15 years. His shuffle grooves and 4-to-the-floor stomps recall Chicago blues drummers Ted Harvey and Fred Below. Influences include Gene Krupa and Charlie Watts. Robert DeCorte (bass, vocals): Longtime jam partner and vinyl-hunting bud of guitarist Schluntz. Wrote and sings the evocative "Last of the Great Train Robbers" on new album. Also plays with Rhode Island jam band institution, Loose Change. 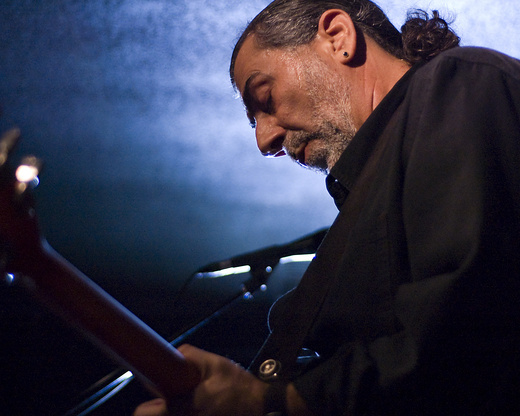 Mike Hallal (guitar, vocals): Some “superb” songs, says Blues Matters! of Hallal’s latest. Influences include Beatles, Rolling Stones and Robert Johnson. Hatchet Blues is the 10th full-length release featuring his songs and performance. Chris Schluntz (lead guitar): Burns thruout the new album, helping ignite riff-heavy cuts like “Crying at the Sun” and the title track. Also authored the funk for “World’s a Place.” Vinyl collection includes Buddy Guy and The Black Keys. "lyrically and sonically... a fine piece of work" by Martin 'Noggin' Norris, Blues Matters!